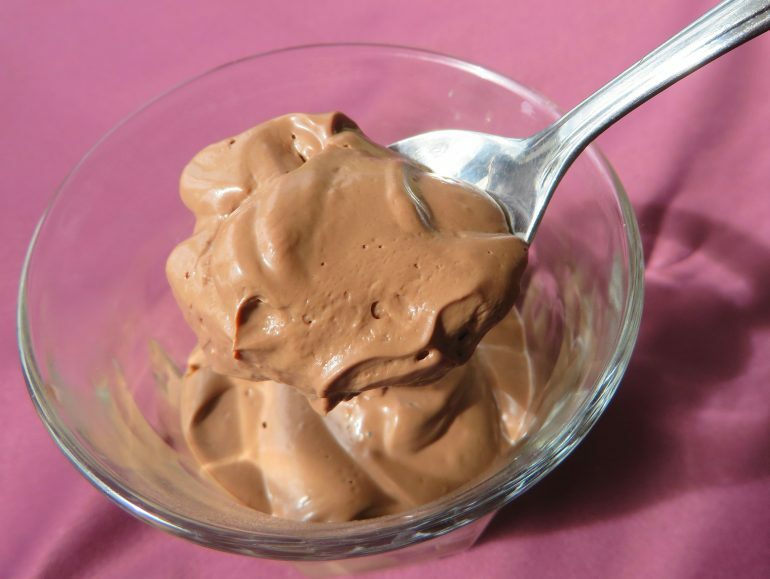 This tofu mousse is a real life saver if you are craving low carb dessert. It's super creamy and nicely soft and firm at the same time. You won't taste the tofu at all. If you want a stronger chocolate flavor, add more tofu. A serving has about 4 g of net carbs and 8 g protein. The portions may seem a bit small, but this stuff is super filling (and you can eat more if you want). Put all the ingredients in the mixing jar of your blender, immersion blender or food processor. Blend until it forms a smooth creamy mousse. Taste it and add more sweetener or cocoa if you like. Divide the mousse over four glasses or ramekins. You can eat it right away or put it in the fridge to firm up. It will keep in the fridge for three or four days. Hands down the most delicious low-carb dessert I've ever had. Rich, thick, filling and chocolatey. Thanks for posting! Glad you like it so much Ana! When you say for "a stronger chocolate flavor, add more tofu", do you mean add more cocoa? Also I used 100% cocoa and feel like less cocoa would have been better, what do you think? I had to add a lot of sweetener. Love you recipes, I make your granola regularly! Hi Bex, I do mean that, thanks! I'll correct it. My partner and I both like a strong chocolate flavor, so I tend to use a hefty dose of cocoa. You can certainly use less if you prefer a milder taste. Love, love, love, love your sharing here on this website. Thank you truly for investing your precious time and energy in making these recipes and the information about how to eat low carb vegan diet in a workable way (like the snacks pages and the food lists.) It is an amazing gift that has changed my life. Simple, delicious, go-to staples to weave into everyday life that you figured out and chose to share here with all those lucky to find you. Thank you again so much, Martine. For this recipe, I have two fun things that have come around: 1. We add 4 or 8 squares of 85% dark chocolate (Trader Joe's) to the coconut oil when it is melting in place of 1 of the tablespoons of powder. Yum! A little bit richer when wanting a Super treat. 2. I also have used this as chocolate pie filling in this crust here https://www.gnom-gnom.com/paleo-keto-graham-cracker-pie-crust/. For super chocolatey fun, add 4 squares chocolate to the crust recipe and 1/4 of a cup of lightly pan toasted shredded coconut. I actually just press the crust into two shallow soup bowls and bake for 10 mins. Then put the filling in and chill. Coconut cream whipped cream on top. Planet earth heaven. Thank you again, Martine, for all you provide here. Truly. Forgot to say we for the crust recipe we use filtered coconut oil for the butter. I sometimes add a teaspoon or so of Earth Balance spread for some "buttery" flavor if in the mood. It's great with just the coconut oil, too. Hi Soul, that’s a really kind comment, thank you so much! Your tips are great too!